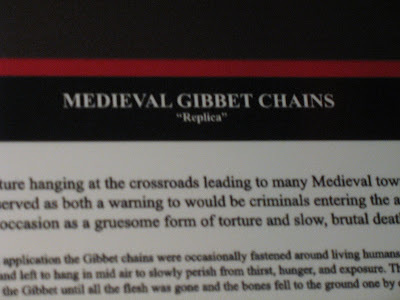 Julie informs me that at the museum of crime and punishment in DC all the replicas are labelled like this. This leads me to believe they are not really replicas, but they are attempting to deter theft. Anyways, did You know in other languages quotation marks are used to insert a name, title etc. Hinting false claim is a secondary use of quotation marks. First it was a "Own Name or Title" then it became "So-called" but the primary use is still proper. Reminds me of something one of the local museums did when they first opened. All of the exhibits had dates that were "circa" something. Such as "Circa Dec. 13, 1942". Apparently, they weren't sure AM or PM, or maybe the artist had started the work the previous day? Seems the "Experts" at the museum (note the correct use of quote marks, there) thought that circa meant date, instead of about.